St Govan's Chapel near Bosherston on the Pembrokeshire coastline. 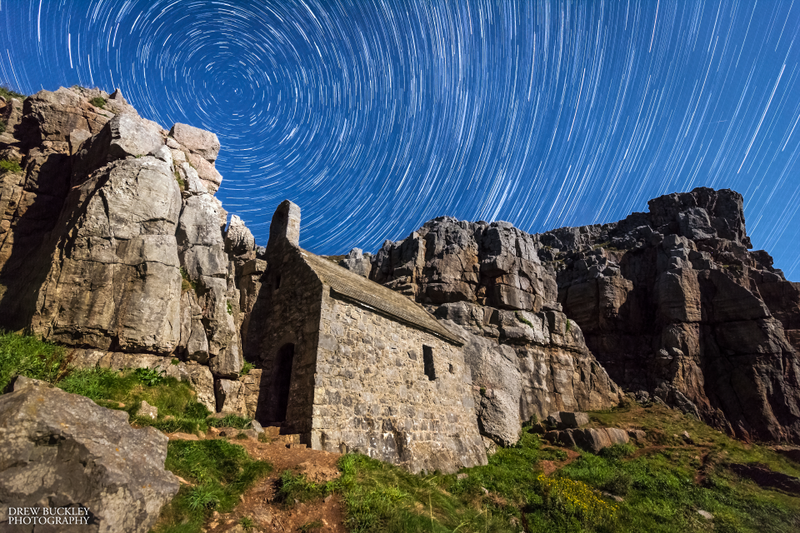 Long exposure of the stars rotating around Polaris (the North Star) while the cliffs, chapel and foreground is light by the full moon. A small Perseid meteor is also captured to the right of the image. This image again took quite a bit of planning, this is part (45 minutes worth) of a three hour time-lapse sequence I was recording for a future film compilation. Finding an evening when the military range was open for access, a clear night, the moon in the right position and intensity and also don't have to get early the next day :) meant for a waiting game with the calendar. Thankfully there was enough of a clear spell last night for a clean sky for perfect star trailing.